Punctuation? It Can Be Fun. . . . Seriously! Did you see what I did there . . . in the title? Used lots of punctuation? Trying to add a little humor to what appears to be an overwhelming next few months. One final semester where I play two main roles–I’m a student and I’m a teacher. As a student, I am working to finish my master’s degree in December. I’m taking a class in research where I can finally officially learn how to navigate all of the electronic sources online. I learned a little along the way to get through some of my other courses, but I’m thrilled to get some real training (my last big research paper would have been written on an electric typewriter after doing research in the card catalog). AND, I’m finishing my research paper where I’m working to prove the importance of Literary Citizenship in university creative writing programs. Green for class activities, red for papers that need to be prepped and photocopied, black for homework and notes to myself. 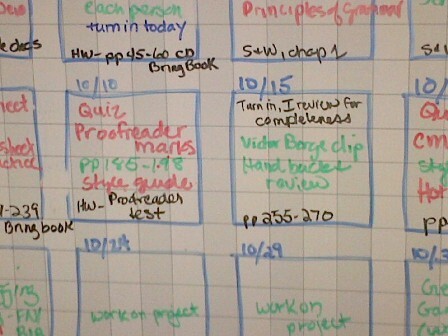 Basically we’re doing content editing in September, copyediting in October, and proofreading in November. So the middle of October we work on proofreader marks (which certainly come in handy in copyediting), and they get a chance to learn about the Chicago Manual of Style and house style guides (I know–this is beyond exciting for you). And I show them this clip of “phonetic punctuation” by the amazing Victor Borge, a pianist who was also a comedian. We lost him in 2000, but his brilliance lives on. You see, punctuation can be fun! And that’s just what I hope I can teach my students! Punctuation can be fun!!! Thanks for that video. Wow. Your schedule is amazing, Linda. 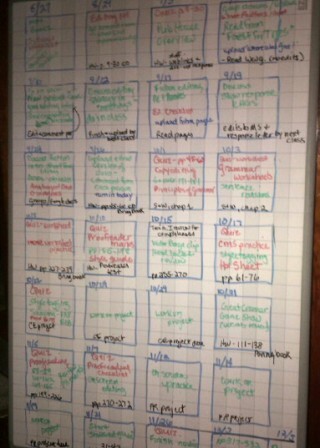 But then you were always so organized. You’re in the home stretch!!! Woo hoo!!! 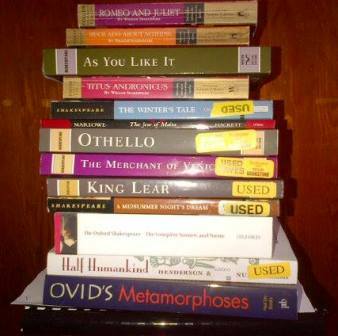 I had to take Shakespeare and had a similar stack of books. Fun times! Linda, I learn so much from your posts, including the fact that it’s possible to juggle all a woman has on her plate and remain sane. Thanks for taking time to teach us online as well as instructing your fortunate students in person!